Few things in computing are as vital as the lowly hard drive. If your memory goes bad or your processor blows, it’s easy enough to switch out; when a hard drive gives up the ghost, your precious files expire along with it. 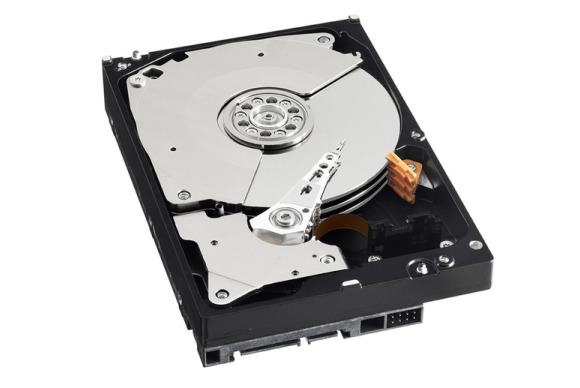 All of which begs the question: Just how long do hard drives last? We now have a semblance of an answer thanks to BackBlaze, a cloud storage service recently highlighted in PCWorld’s pain-free backup roundup. BackBlaze utilizes more than 25,000 consumer-grade hard drives to back up your data, and it just released a comprehensive report on the lifespan of those drives over a four year period. Hard (drive) data, here we come! Let’s get the big reveal out of the way first: Only 26 percent of BackBlaze’s drives failed during the four year testing period. That’s not too shabby for a component frequently plagued by anecdotal tales of woe. More interesting is exactly when and how those failures happened. 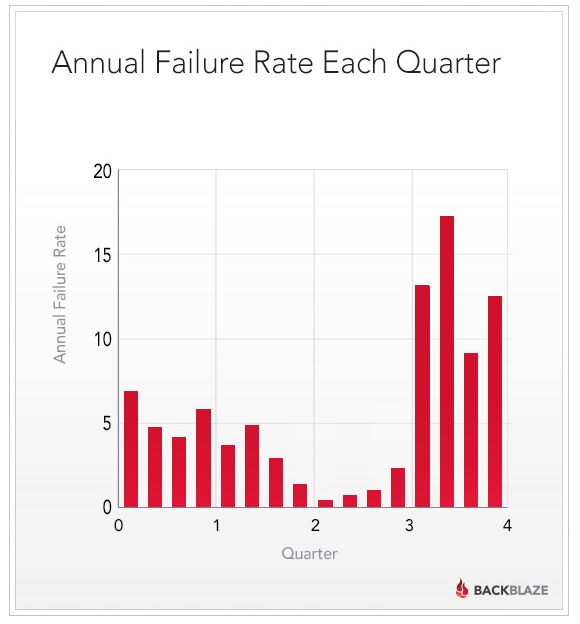 BackBlaze’s hard drive failures by quarter. The chart above shows the drive failures following the “Bathtub curve” held near and dear by reliability engineers. Around 5 percent of BackBlaze’s drives failed within the first year and a half, falling prey to factory manufacturing defects. After that, reliability settles down from year 1.5 to year 3, succumbing mostly to random failures, before worn-out drives start to die en masse, causing the failure rate to spike to a double-digit annual percentage. BackBlaze doesn’t have data beyond four years, but the company expects drive deaths to hold constant at around the 12 percent failure rate seen in year 3 to 4. 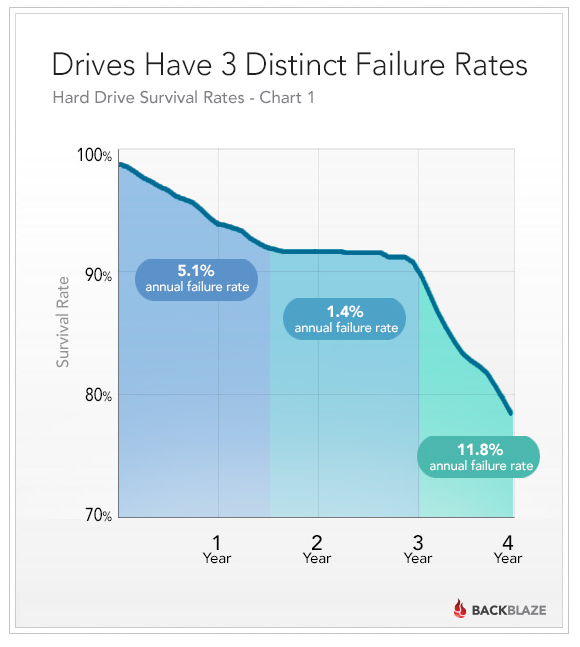 BackBlaze’s annual hard drive failure rate. Double-digit failure rates sound scary, but put it in perspective: Only 1 in 20 drives failed due to manufacturing defects in their early days, more than 90 percent of BackBlaze’s drives were still spinning strong after three years, and nearly 80 percent of drives survived to four years in a server farm. That’s none too shabby, and the data helps shine a light on why warranties on consumer-grade hard drives tend to be either one or three years in length. It also drives home the point that you really, truly should be backing up your data on a regular basis, especially with brand new or three-plus-year-old hard drives. Given the comparatively sky-high cost of solid state drives, don’t hold your breath for a similarly large-scale study of the lifespan of SSDs to pop up any time soon. Just follow the best SSD practices, back up your data, and keep your fingers crossed.